Refined Colorado Cuisine featuring Craft Beer and great selection of Whiskey. Al Fresco dining Creekside. Lunch and Dinner from 12:00. Best Happy Hour in Crested Butte from 3:00-6:00!!!! $2 Pints of Colorado Micro Brews. 8oz All-Natural Colorado Beef │ Epic Sauce │ "LTO"
Applewood Bacon │ Smoked Cheddar │ Mustard │ "LTO"
This is one of the best restaurants in CB. The menu is eclectic. The bison meatloaf and trout were outstanding. We enjoyed it so much that we returned a second time during our week's stay. Highly recommended. Interesting menu, attentive wait staff. Bison meatloaf was excellent. Highly recommended. Everything we had was delicious, from the appetizers to the entrees to the drinks and desert. Cant recommend enough! Great place for a meal in CB. Food was very good, service was wonderful. Never had to wait for a table, even during busy Spring break. The absolutely best hamburger/buffalo burger in town. The other food is fresh and uniquely prepared. This place serves delicious food and it’s never crowded. Their servers are warm and gracious. It’s also a great value. Really very good food. We had the Brussel sprout and chorizo appetizer and the bison meatloaf entrée. Both were very tasty! The initial service was slow, then we complained and it got better. They even comped us a glass of wine. The wedge salad and short ribs are winners. Excellent dinner at this restaurant. The food and the service were excellent! My favorite place in Crested Butte. They can accommodate small or large groups. Quiet enough to have conversations. But best of all the food and the service is always excellent. We went as a party of 8. It’s a cozy place and the staff, foof, ambiance make you feel like you’re at home. The online menu did not match the menu when we dined and were disappointed that the items we wanted were not available. The desert which was supposed to be a hot cookie, arrived cold and dry as it was pre-cooked. The manager should meet with diners to provide service recovery as needed. The buffalo meatloaf is the bomb! Service is excellent and very friendly. Liked is so we returned for breakfast the next morning. The ricotta lemon pancakes were heavenly. A great find in CB. Was a really great night! Will return! 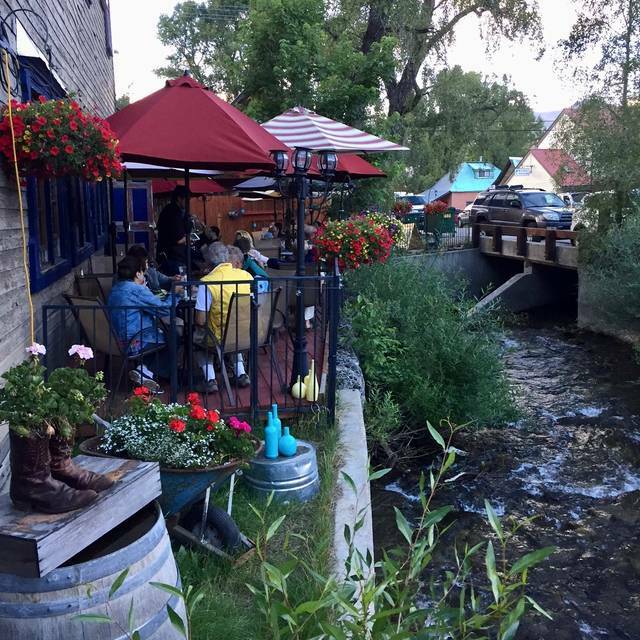 We enjoyed a great dinner sitting out on the terrace beside the creek on a beautiful, warm evening. Two of us had the kale salad with grilled salmon that was cooked perfectly. They have a nice wine list by the glass. Our server was very attentive and food came very fast. Would totally recommend to visitors and locals! Dined on the patio. Good menu choices! Service was very good and friendly. Will definitely be back! We were on vacation with three other couples and chose Coal Creek to dine. We sat on the patio being the weather was great. Our waiter and food was outstanding and would highly recommend you give this restaurant a try. Our waiter gave us great tips on trails to ride our rzrs. Very busy, rain kept us inside; no fault of the restaurant. Slightly disappointed in food, but we will return next year when back in Crested Butte. Nice casual restaurant with both indoor and outdoor dining. I had the flank steak and my husband had the bison meatloaf. Both tasty. Service was very slow. Server forgot our credit card in his pocket while we were trying to pay—other than that very nice. Special trip with our son and daughter in law. Perfect evening! WE sat outside on a beautiful night. Had the delicious dates stuffed with goat cheese and wrapped in bacon - I could have made a meal of them! There were six of us and several had the burger which was great, a few had the Full Monty which was 2 tacos, a small Caesar salad and a side of mixed beans. I had the short rib tacos - yum!!! Another person had the mahi tacos - again YUM. They had a nice wine selection and we felt prices were reasonable. The service was poor and slow. The wait staff forgot things and did not get some items requested. They were not busy at the time , just disorganized, although they were very pleasant. The bison meatloaf ( $19)was good and the nachos a step above average. Always good food. The buffalo meatloaf is outstanding. The owner is always there making sure that all is done well. One of the best bargains in Crested Butte and they take reservations. Great little spot in downtown CB!! Kind of a more limited menu but staff worked with us to modify some selections. Grilled salmon was tasty and my spouse had the Ruben and really liked it. Good beer and wine selection too! Will return for another visit. Restaurant was average. Out of the appetizer item we wanted. Food was tasty but steak frites disappointing. More diversity of menu choices would have been preferred. Me nu items a bit pricey. Great restaurant! Food was delicious. Service was outstanding! We will definitely return to this restaurant! Coal Creek is located on the first floor of an old rustic hotel. Service is fast and food is good but not exceptional. Worth a visit for a drink at the bar or a look at the restaurant. We have had breakfast, brunch, lunch and now Christmas Dinner at this restaurant. Locally owned and operated, great friendly staff, and beautiful summer porch. The cocktails are beautiful and they have a great list of draft beers and wine choices. We have now tasted the homemade granola, banana bread, steak and fries, hamburgers, nachos and the buffalo meatloaf and short ribs.....way impressed with every bite. We had the most marvelous Thanksgiving dinner at Coal Creek Grill. They made it such a special celebration. And delicious! When for Thanksgiving Dinner. They had a great turkey special. The food was great as it always is when I go - especially for breakfast. The Atlantic Salmon entree was excellent. Well stocked bar. Nice variety of whiskey and whisky. Servers were polite and friendly. Can get crowded for dinner so make a reservation. Breakfast is a hidden treat as well. No long lines and the granola pancakes were outstanding! Coal Creek Restaurant offers excellent dishes (Chef/Owner Doug worked for 6 years at the Mansion in Dallas. ), the desserts are extraordinary (thanks to Christine), the patio next to the creek is perfect for relaxing and sipping, and the wait staff is attentive and friendly. We highly recommend Coal Creek Restaurant! We ate dinner on the patio with our 2 daughters, son-in-laws and twin two-year old grandsons. What we especially liked was the patio dining - nice shaded patio near a creek. It gave the grandsons lots to do while waiting for dinner! Patio is very pet friendly - there were two cute puppies across from us and each was served a bowl of water upon arrival! My daughter ordered the garlic fries for an appetizer and thought they were great! Given the size of our group - not sure what everyone ordered, but, it appeared everyone liked their dinners due to their clean plates! The service was a little slow - but, we were in vacation mode - and since the grandsons could get down and walk around without being disruptive, it wasn't a problem. The short rib was the BEST I've ever had!! Pleasantly surprised by the great food in what appeared to be the same restaurant as was run by the previous owners.